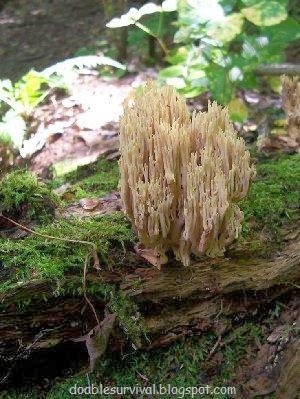 I'm in the northern US, so you may want to check to see if these grow in your area or not. I'm not a mushroom expert. I'm just sharing what I have learned and experienced myself. I'm sure you've heard it before but "If in doubt, throw it out!" As with any new food like this, you should try a small amount at first to make sure you are not allergic or if you are sensitive to certain foods. 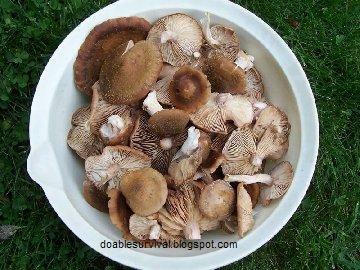 When it comes to wild edibles like mushrooms, I never trust just one web site's information. 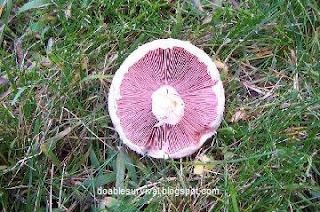 I search several places to make sure I have the right mushroom and that it is indeed edible. I look through different photos and compare. I look for notes on look-alike mushrooms that are poisonous. If they are a harder mushroom to identify, I will see what color spores they are supposed to have. ...and, if I'm still not certain, I don't eat it. Doing a spore print is easy. Simply take the cap off and set it on a piece of paper or glass for several hours to overnight and see what color pattern it makes. I try to use a color that isn't too dark or too light so that I can see the pattern whether the spores are dark or light. Some people will use both white and dark paper. Yes, we need to be careful and make sure we don't pick and eat anything poisonous; but on the other hand, I don't want to scare people away from foraging because there could be some very tasty things right outside their door. These can also be found in late summer to fall. There are different varieties and the color varies some. I found some of these nice white ones. I've eaten others that are a little more tan and have more of a branch appearance than coral. Do a search on-line and check out different pictures. They are usually found under conifer trees. They are said, in some people, to have a laxative effect or cause mild stomach upset. I've never had any problem. Just don't eat a bunch at once until you have tried them. 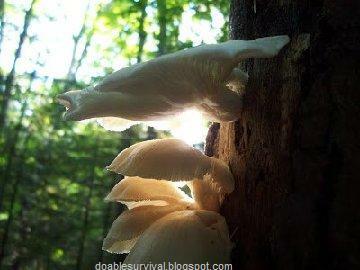 good; but the ones growing out of a tree tasted terrible, so it can vary. 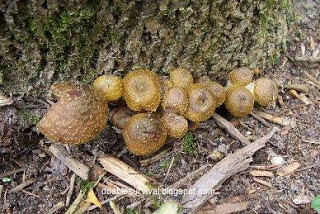 You can find these in the fall, and they are usually found on dead trees or growing up from tree roots. 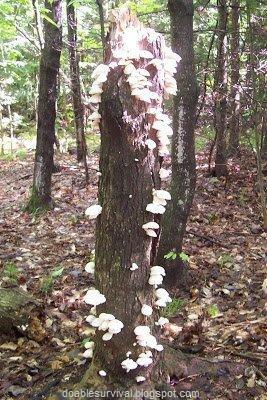 Note, you shouldn't eat these if they are growing on a conifer tree (such as pine, tamarack, cedar, etc.) If it is the Laetiporus Suphureus, it will have a yellow underside; and the inner part may be too tough to eat unless you boil it for a while. 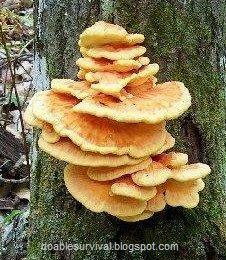 If it is the Laetiporus Cincinatus, it will have a white underside and grows on underground roots of trees or from the base of trees; and the whole mushroom is good to eat, although both are fully edible. You want to cook them thoroughly. Ok, this is one you have to be very careful about as there is another mushroom that looks very much like this one; so only try it if you are sure you have the right one. A spore print is very helpful to identify this one. 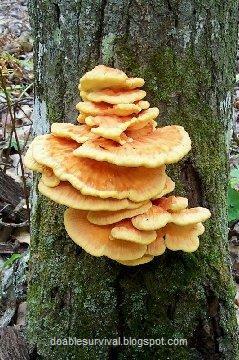 They normally grow on or near old stumps or rotting wood in clusters and are brown. I have some in my yard that are more of a grayish color too. 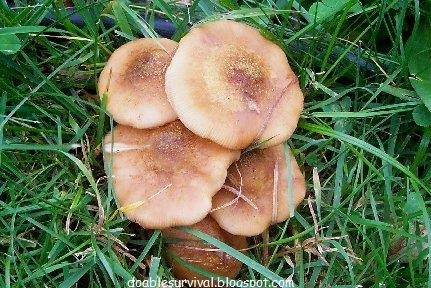 When identifying Honey Mushrooms, they have a "five o'clock shadow" or what looks like fine hairs or stubble on the cap that concentrate in the center. Do a spore print. They have white spores. I used to flour them before I fried them because they are slimy when wet; but when I tried sauteing them in butter the way I do Morels, oh my goodness! So good. I like to cook them well until they are almost crunchy. ...but that's just me. :) To freeze them, boil for 5 minutes. Look for the "5 o'clock shadow" in the center. my yard than the others, but they are also Honey Mushrooms. 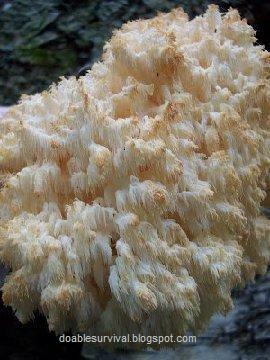 Also apparently known as the Bearded Tooth mushroom and the Pom Pom mushroom. They are white to yellowish with age. 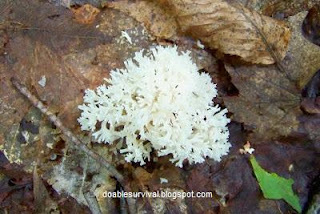 They grow on dead or dying hardwood, specially oak and beech. You can find them in late summer and fall. They are said to grow higher up on the trees. I actually found this one on a birch in the woods behind my house. Cook slowly and, after some of the moisture is gone, add a little butter. You can saute them and freeze them for later. They have a little bit of a seafood flavor. I loved it. Yum! I've only ever seen this one and a couple of little ones by it. 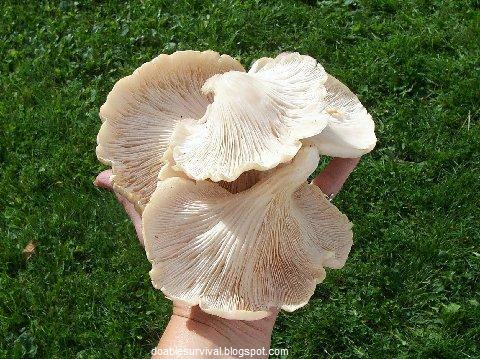 Oyster mushrooms are called that because of their appearance, not their taste. They have a white to light gray/lilac spore print. 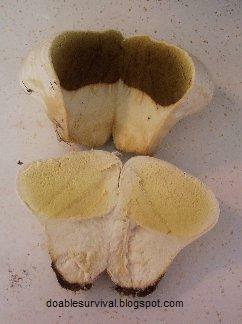 The gills are decurrent meaning they go down onto the base. You will find them on dead trees or logs. 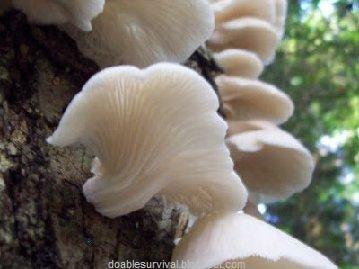 Some of the Oyster mushrooms can have a bit of a licorice scent. The ones I picked didn't. They can be dried, sauteed in butter and frozen, or blanched (add to boiling water, boil for 3 minutes, and then rinse with cold water) and frozen. 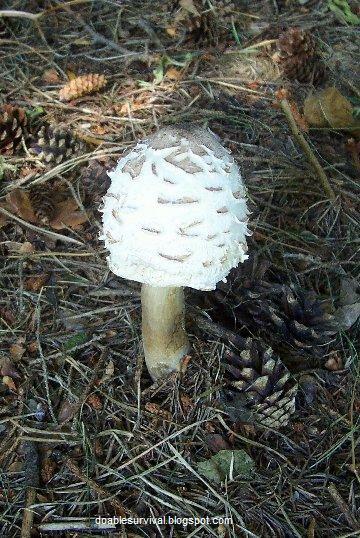 Also known as Meadow Mushroom and Horse Mushroom. I can't believe I just learned about these this summer, and they were in my own back yard! I thought they were the same poisonous white ones that grow in my front yard; but if you turn them over, they are pink underneath and very tasty. Actually, they start out light pink underneath and then turn a brighter pink and then turn a dark brown. 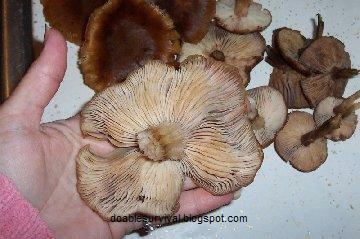 They taste kind of like the button mushrooms you buy in the store but more flavorful. I did a spore print just to be sure I tried them. They have a dark brown spore print. 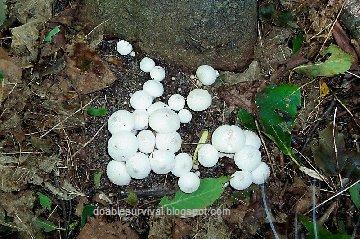 (The poisonous white ones have a white spore print.) I simply saute them in a little butter and sometimes scramble eggs with them. 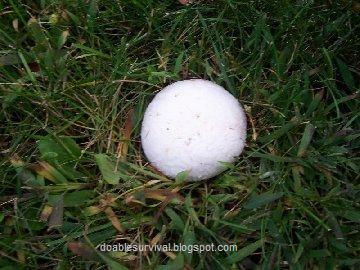 I love puffballs but mainly because I find them in my yard in the fall and know other places to find them. The taste is actually quite mild. 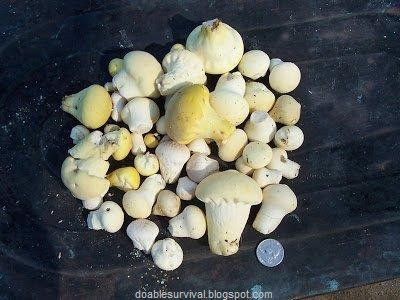 For beginning mushroomers, these are a pretty safe mushroom to start with unless you get careless. Just make sure to slice them and check inside to make sure there is no evidence of gills or a stem forming (young poisonous mushroom). Also, you want to eat them before they start to turn yellow or brown inside. They should have a uniform appearance inside like a nice slice of bread. 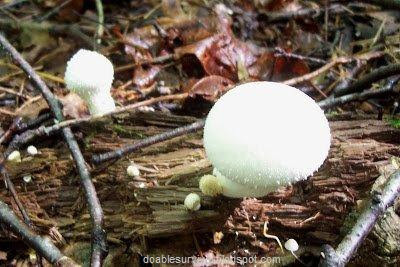 There are no poisonous puffballs. 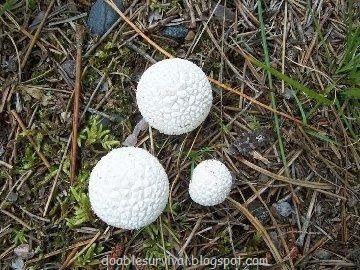 There is a look-a-like "pigskin puffball" that is poisonous, but you can't mistake it as it is black inside. It has an off appearance of a "pig skin" on the outside also. You can cook with them many ways. Some people even bake them into bread. I simply fry them in a little butter and scramble eggs with them. Yum! I have some in my freezer now. You can saute them and then freeze them or dehydrate them. I find a few different kinds. 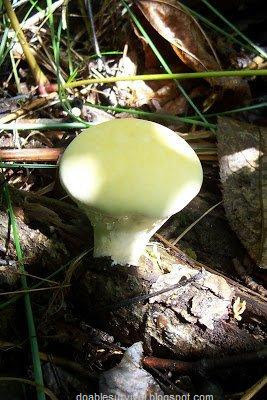 There are the small white ones ("gem-studded"), some larger ones that look a little more yellow and get bigger, and some that grow directly on dead trees; but they are more rubbery and not really worth picking. I finally found a couple of the "giant puffballs" this summer but they were too far gone already! I was so disappointed!!! I took some pictures though. Also known as "Inky Cap" or "Lawyer's Wig," the Shaggy Mane, Coprinus Comatus, has a bullet-like shape when it comes up, before the cap opens, and is covered with delicate white scales. They are a favorite among mushroomers and easy to identify; but if you are new to Shaggys, they may be a littler harder to identify when they are first coming up from a couple of others; so wait until they start to mature. When it matures, the mushroom's cap starts to turn into an inky black goo, starting at the bottom edge and then melting up. They should be eaten within 4-6 hours of picking as they deteriorate fast or you can saute them and freeze them. 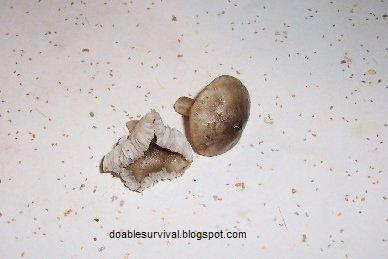 You can find them in late summer and fall and are often found in yards and along gravel roads. They are very good in soups, stews, and sauces. I like them sauteed and mixed in scrambled eggs myself. 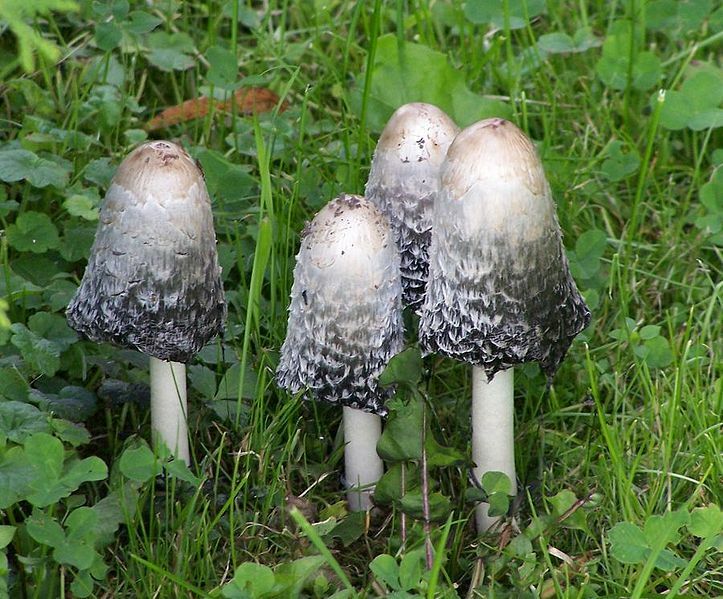 :) Shaggy Mane can rarely cause a mild reaction in some people when consumed with alcohol, so you may want to stay away from alcohol when eating them. 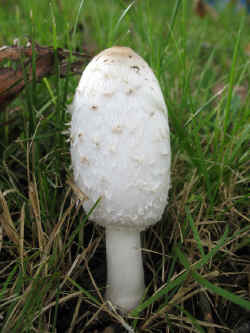 Shaggy Mane turning to an inky goo. 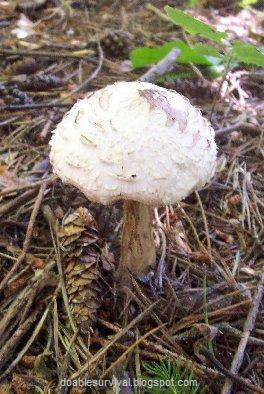 Finally had a couple of Shaggy Manes pop up on my property this year, Parasol ones. I don't remember seeing those before but here is a photo I took. So tasty!!! Just wish I could find more! As always, make sure you have the right mushroom and, if in doubt, throw it out. I thought these were just ok, and I'll eat a couple in the fall; but it is nice to know what is edible in case you are in a survival situation. These are normally found growing under pine trees. I found these under my Tamarack tree. You want to peel the skin off the cap as they can make you ummm go to the bathroom a lot, putting it delicately. You should also cut the spores off on the bottom side of the cap (not sure why). 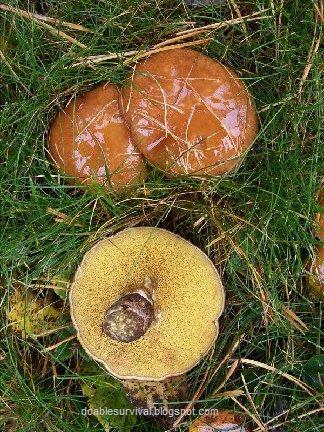 The spore print is brown. 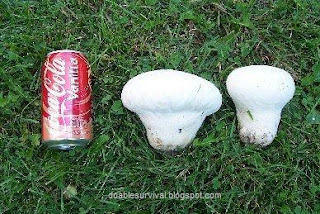 Do you know if I can use the puffballs in a recipe to make cream of mushroom soup? A friend of mine gave me some mushrooms he called "cluster mushrooms" but I can't find any information on them. We, too, had them growing on a stump of tree that we cut down about 12 years ago (we actually mow right over it because it is level with the grass). they are creamy colored and he said once you see them in your yard, they are generally only good for a couple days because a worm goes up into the stem. Thanks!